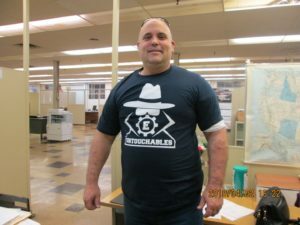 robotic Archives - HGR Inc.
AWT RoboBots sponsors support their team: Go Euclid High School Untouchables! Manufacturing overhead, including factory supplies, depreciation on equipment, and replacement parts, can take a toll on a company’s wallet. Then, when they need to add equipment or replace aging systems, they’re faced with the complication of choosing among options to buy used, buy new or lease. When replacing equipment, a manufacturer needs to sell the old equipment in order to free up floor space and capital. 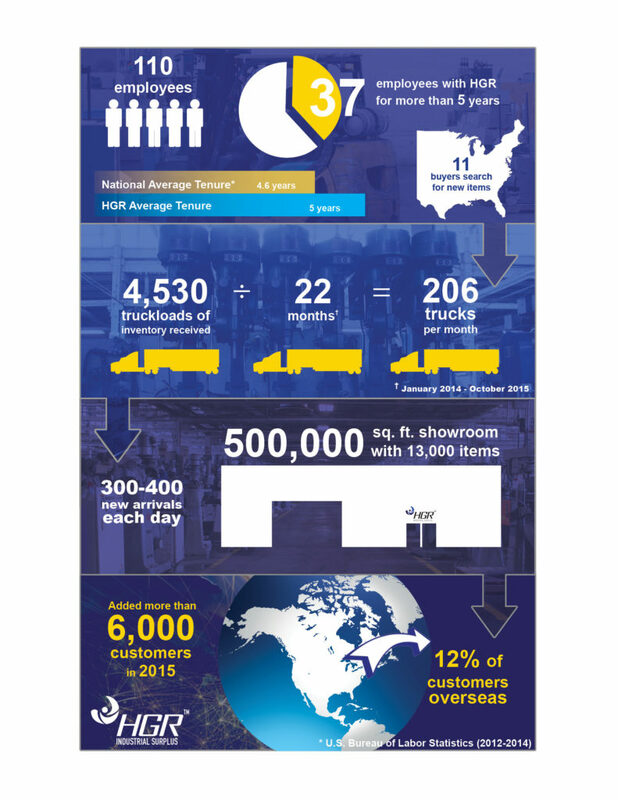 That’s where HGR Industrial Surplus comes into the manufacturing pipeline to assist a business’ growth and investment recovery by providing used equipment for sale or lease and by buying used equipment to help companies turn surplus assets into cash that will help pay for the upgrade or replacement. 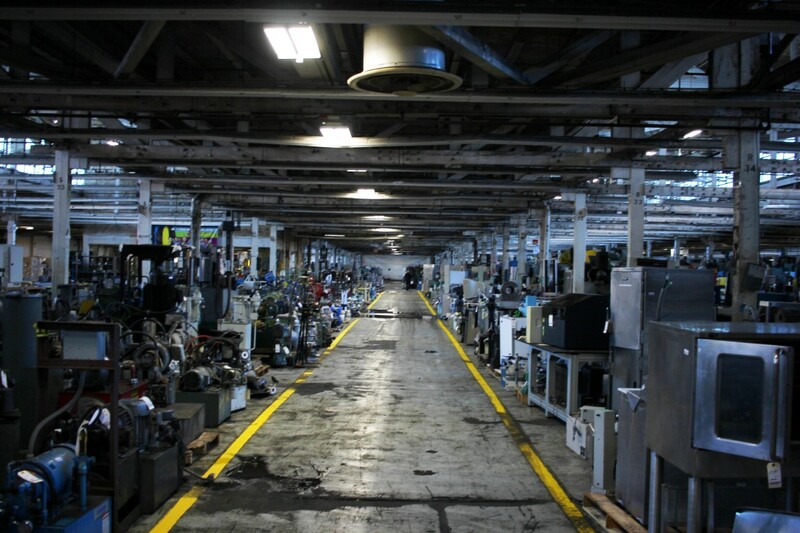 Since scrap prices are at an all-time low, most companies can probably can do better by putting the equipment back into service through resale, which also is environmentally responsible. And, someone else will be able to save capital by buying it used or may even use the equipment for parts in the repair of another piece of equipment. 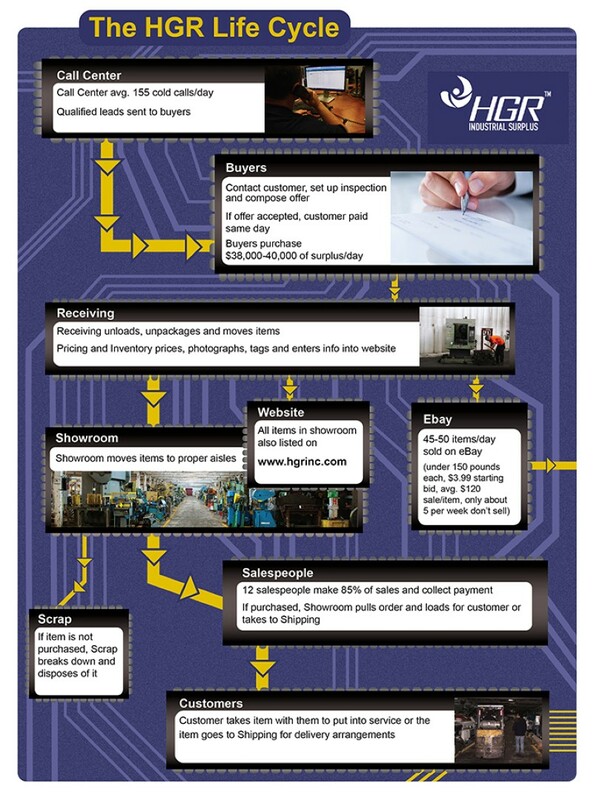 Reselling to HGR also saves the seller the time and frustration incurred in finding potential buyers or in spending money to place ads in industry publications or resale websites then monitoring and responding to inquiries. If a company is looking for a piece of equipment to replace one being taken out of service or to expand its line, it either can buy the used piece of equipment or lease it through HGR. If they choose to buy it, we have a 30-day, money-back guarantee that mitigates risk, and we are a Machinery Dealers National Association member, which means that we abide by their stringent code of ethics. Should a company choose to lease a piece of equipment, we have a relationship with a finance source that, essentially, will buy it from us and lease it to the company. Once purchased or leased, our Shipping Department can set up transportation. Then, from the date that the item is purchased, a customer has 30 days to pay and 45 days to remove it from our showroom. SHOPPING HINT: As soon as the item is received, our Buy Department prices and photographs it then posts it online. Some items never make it to the showroom floor because they are purchased as soon as they are listed. So, it’s important to have a relationship with one of our salespeople who can keep a customer in the loop if something comes in, or a customer can check our website or our eBay auction for the most recent arrivals. And, though we sell used equipment, we sell tons of other stuff, including shop supplies, fans, fixtures, laptop bags and printer ink cartridges. You never know what you will find. We get 300-400 new items each day in many equipment categories, including welding, machining and fabrication, supply chain/distribution, plastics, chemical processing, electrical, furniture and finishes, hardware, motors, robotics, shop equipment and woodworking. There’s something here for everyone. Many makers and hobbyists shop at HGR and upcycle equipment pieces and parts into other useable objects. For this team, it’s all about workforce development and creating a skilled workforce. More than 3,500 students are attending the workforce programs, including youth, adults interested in a career transitions, students who already have a degree but are returning to upgrade skills, older adults interested in a second career, employees who need additional training for their current role, and job seekers interested in starting a career. Booker moved to Ohio two years ago from Pennsylvania to accept the position. Ganaway was moved from Tri-C’s robotics program to additive manufacturing in order to write the grant to fund the program. Now, two years later, the fruits of their labor are paying off in the Manufacturing Center of Excellence (MCoE). The college offers training by which students can earn college credits and industry certifications. In the welding training, they learn MIG, TIG, and stick welding. 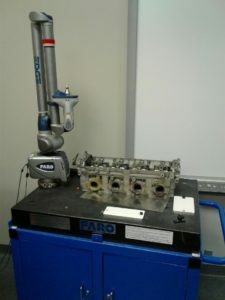 Right Skills Now affords students with CNC training in manual and automated machining. They train on Haas CNC mills and lathes, and on Bridgeport manual machines. The 3D/additive manufacturing training is in digital design, and students receive training in multiple 3D printing technologies, including the use of 3D printers, scanners, and other equipment available through the Ideation Station where they can work with a techno router, laser engraver, etc. 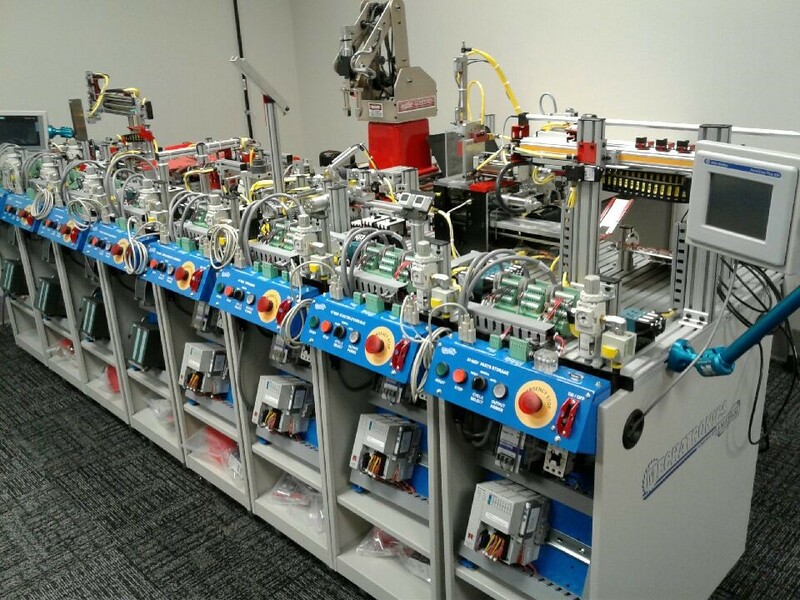 In Mechatronics, students learn techniques in mechanical, electrical, computerization, and gain an understanding of how these systems work together. Finally, as a certified production technician, students are prepared to begin career opportunities in manufacturing and earn four industry certifications in areas of safety, manufacturing processes and production. 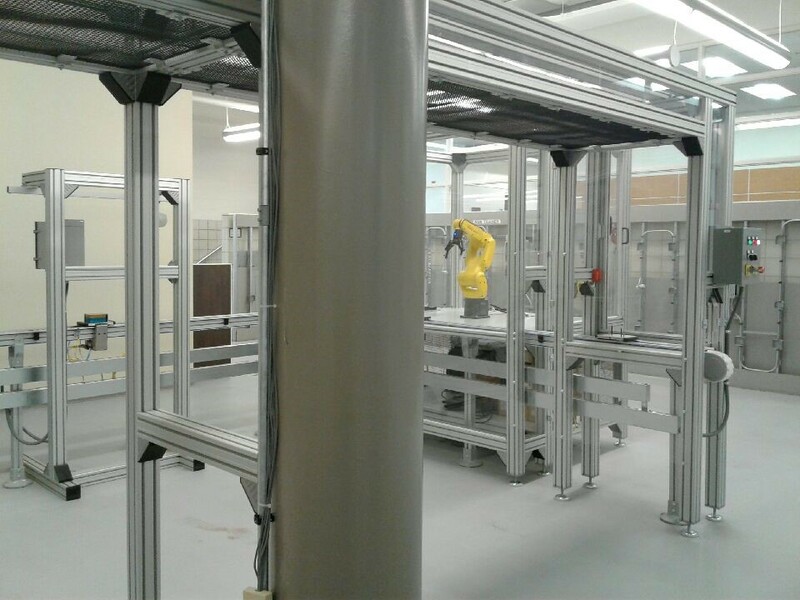 This is a hybrid training program that includes training on the integrated systems training equipment to prepare them for occupations in material handling, assembly and production. 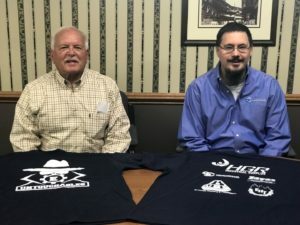 To stay connected to industry, the program has several advisory committees made up of industry professionals from the welding, machining, electrical, mechanical, 3D printing and transportation sectors. They also have specific employer-based programs, including First Energy, Swagelok and ArcelorMittal, who have advised the college on customized programs that lead to employment with their companies. Local businesses, such as Cleveland Job Corps, Cleveland Municipal School District, Towards Employment, Boys & Girls Club, Ohio Means Jobs, Ford, General Motors, Northeast Ohio Regional Sewer District, Cuyahoga Metropolitan Housing Authority, NASA, Arconic, Charter Steel, and others, utilize the program’s services. I well remember the day. “Fighting robots?” I guess I had envisioned a tower of blocks with arms and legs throwing punches; I was skeptical at best. However, my dad had a completely different vision in mind. He’d just come home after visiting a National Robotics League competition. He imagined leading a group of young men and women, the next generation to enter the machining industry in which he’d spent his career, to construct from scratch a robotically engineered machine to face competitors with a high-speed, hardened tool-steel weapon. Though I wanted to be supportive, I can’t say I fully understood. That is until that first day of competition. It didn’t take long for myself, as well as the rest of our family, to realize the vision in which my father had spent countless hours striving. Even my two-year-old, at the time, came home battling his graham cracker halves against each other. We’d all caught the fever. Yet, behind the sound of grinding steel and robots sent flying through the air in three minute rounds, has always been the educational component. Most schools are not fortunate enough to use classroom time to brainstorm, build and perfect their robots. However, A-Tech students, who are training to go into the machining industry after graduation, get the full spectrum of education from conception to final build, from battle to battle. They learn to meld ideas, strategies and concepts to create a robot that will withstand their competitors’ attacks. Throughout the school-year-long process, the students are hands on, machining raw material into each specific component of the robot’s assembly — weapon, axles, wheels, frame rails, base plates, etc. In addition to the parts it takes to assemble one robot, they compile enough for three complete machines, in the event that damage caused to the robot will call for a replacement component the day of the battle. Then the robot is assembled and analyzed on weapon speed, belt tightness, weight limits, drive control, etc. with adjustments made as needed. Finally, through a timed obstacle course, the drivers are selected, final tweaks made and the robot declared battle ready. With the investment of their time comes each student’s goal: Defeat the opposition, which makes success sweeter when it comes. This year, A-Tech did just that, coming out on top for a second consecutive year at Lakeland Community College in the AWT RoboBots competition where they took home the first-place trophy from 25 opposing teams. This time, however, with the bragging rights of going undefeated throughout the day. 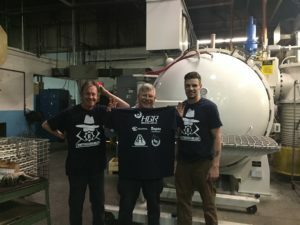 At the National Robotics League competition in California, Pa., through a double-elimination bracket, the A-Tech Machinists tied for 13th place out of 64 teams. It was another great year of competition for not only the fans not only in the stands, but also those watching the live broadcast from home. Though, if you asked my dad, his greatest achievement wasn’t another trophy. It was the opportunity to instill in the next generation lessons in both the machining industry and in life, through a hunk of metal. 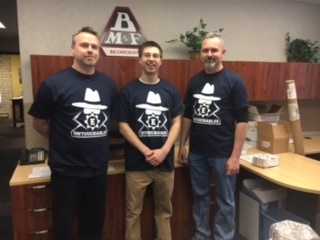 In fact, 10 financial sponsors have backed that mission to be a part of the change in Ashtabula County: to teach through experience and personal investment the value of hard work. The hum of the weapon, sparks flying on contact, curling metal, bots rendered useless then reconstructed are just the surface. Behind all of it, is a draw for students to realize the necessity of the machining industry as they gain the skills to succeed within it. This year I brought home two excited kiddos who took foam building blocks, constructed their own “robots” with unique names and battled them against each other in makeshift rounds. I may be a little biased, but I’m so thankful that my dad had the foresight to see this thing through and the momentum from year to year to keep pushing his students to greater heights. It isn’t just the students who are all the better for it. Euclid High School’s Robotics Team made us proud at the 2017 AWT RoboBots Competition! 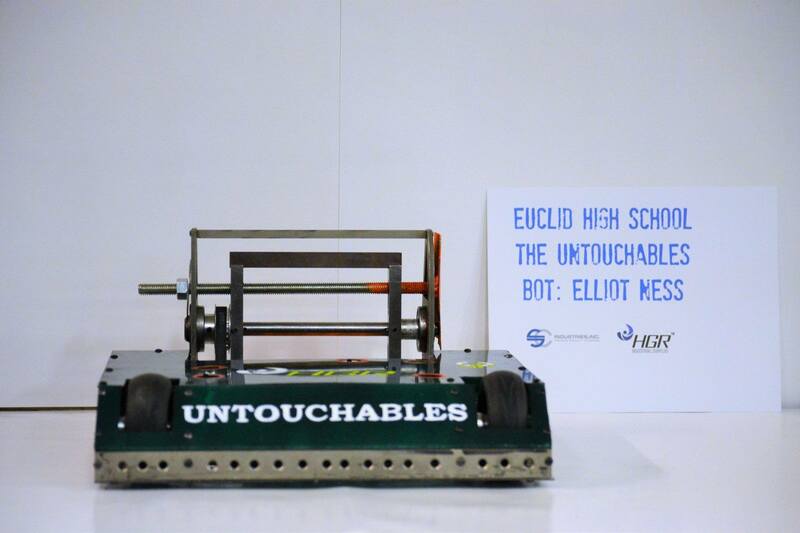 Congratulations to Euclid High Schools’s Robotics Team “The Untouchables” and their battle bot “Eliot Ness” for making it to the fourth round of the 2017 AWT RoboBots Competition on Apr. 29 at Lakeland Community College. We are very proud of you and grateful for the opportunity to sponsor an amazing group of students. You all are winners to us! 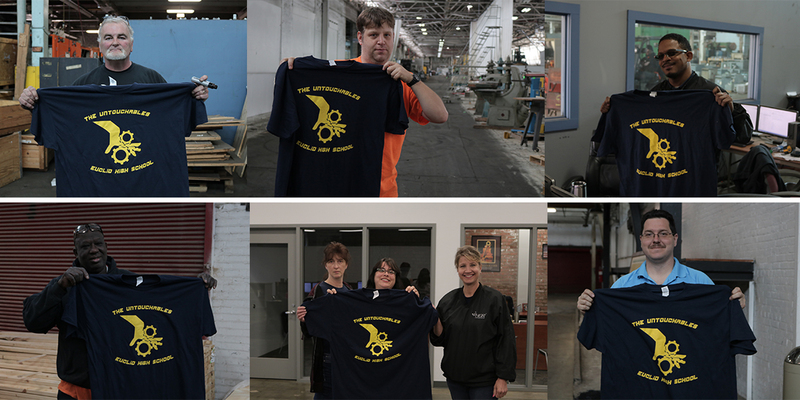 HGR’s employees showed up the day before the competition at work in their team shirts to show our support. 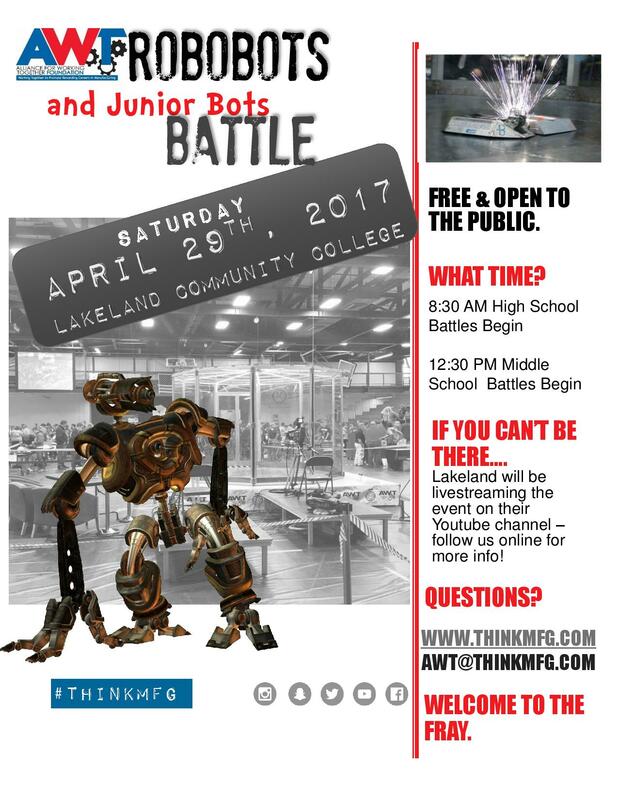 Come on out to Lakeland Community College and join us to cheer on the high-school and middle-school teams as they compete to be the last battle bot standing. The battles begin at 8:30 a.m. The winning high school will be presented with a $500 scholarship check from HGR Industrial Surplus at the end of the event.